Good location and facilities backed up by very helpful staff. Amazing location! Plenty to do at the resort & directly across from the surf beach & surf club. Winning! Very spacious apartment. We only had the w/end but we could happily stay there a week or two easily. The unit i was in although it was facing the road still had a good view of spaciousness which was very pleasing to me. the room itself was excellent. I couldn't fault it at all. The stqaff were very friendly and helpful with any questions i asked them. The view (10th floor Cat II) was amazing - ocean views from north to south. Could hear the waves from our room. Short, easy walk to beach. Having two bathrooms was brilliant - water pressure fantastic. Kitchen very functional, with everything you need to self-cater meals. Beds very comfy. Pool and spa terrific. The size of the unit was massive. The view was amazing!! And the location, so close to everything!! Nice clean room with ocean view, tennis court, swimming pools and bbq area was great. Billiards, table tennis table were good (especially since it rained a lot). We enjoyed the spa, pool and sauna. The Kitchen facilities were good. Lock in a great price for Catalina Resort – rated 8.6 by recent guests! Catalina Resort This rating is a reflection of how the property compares to the industry standard when it comes to price, facilities and services available. It's based on a self-evaluation by the property. Use this rating to help choose your stay! Featuring a tennis court, 2 heated swimming pools and a sauna, Catalina Resort is just 3 minutes’ walk from Maroochydore Beach. It offers self-contained accommodations with a private balcony overlooking the pool, gardens or ocean. 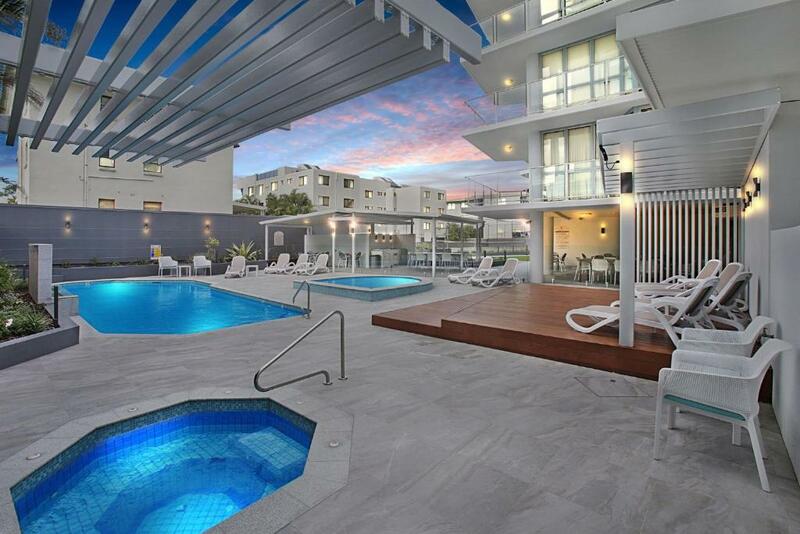 Catalina Resort Maroochydore is located in the trendy Cotton Tree area, 4 minutes’ drive from central Maroochydore. Sunshine Coast Airport is a 15-minute drive away. When would you like to stay at Catalina Resort? Located in the Catalina 1 Building, between levels 2-4, this air-conditioned studio features a private balcony with street views. It also has a small kitchenette, combined bathroom/laundry facilities and a seating area with flat-screen satellite TV and a DVD player. Located in the Catalina 1 Building, between levels 2-4, this apartment features a private balcony with garden views. It also has a fully equipped kitchen, combined bathroom/laundry facilities and a separate living area with flat-screen satellite TV and a DVD player. Please note that this apartment is not air conditioned. Located in the Catalina II Building between levels 2 - 5, this older style air-conditioned apartment features a private balcony with garden views. It also has a fully equipped kitchen, 2 bathrooms, laundry facilities and an open-plan living area with flat-screen satellite TV and a DVD player. Located in the Catalina II Building on level 3, this older style air-conditioned apartment features a private balcony with garden views. It also has a fully equipped kitchen, 2 bathrooms, laundry facilities and a separate living room with flat-screen satellite TV and a DVD player. Located in the Catalina II building between levels 6 - 15, this air-conditioned apartment features a private balcony with ocean views. It also has a fully equipped kitchen, laundry facilities, 2 bathrooms and an open-plan living area with a flat-screen satellite TV and a DVD player. Located in the Catalina II building between levels 6 - 12, this air-conditioned apartment features a private balcony with pool and ocean views. It also has a fully equipped kitchen, laundry facilities and a separate living room with flat-screen satellite TV and a DVD player. Located in the Catalina 1 Building on level 5, this apartment features a private balcony with garden views & ocean glimpses. It also has a fully equipped kitchen, 2 bathrooms, laundry facilities and an open-plan living area with flat-screen satellite TV and a DVD player. Located in the Catalina 1 Building on levels 6-12, this apartment features a private balcony with ocean views. It also has a fully equipped kitchen, laundry, 2 bathrooms and an open-plan living area with flat-screen satellite TV and a DVD player. Located in the Catalina 1 Building, this apartment features a private balcony with ocean views. It also has a fully equipped kitchen, a laundry and an open-plan living area with flat-screen satellite TV and a DVD player. Located in the Catalina 1 Building, this renovated apartment features a private balcony with ocean views. It also has a fully equipped kitchen, a laundry and an open-plan living area with flat-screen satellite TV and a DVD player. Please note that this apartment offers air conditioning throughout. Located on the 17th level of Catalina I this air conditioned apartment has panoramic ocean views. The master bedroom features a queen sized bed and uninterrupted ocean views. There is a flat-screen TV with DVD player, a walk in wardrobe and a large full sized marble bathroom, with a hot tub and separate shower. The apartment also has 2 additional twin bedrooms and another bath and separate toilet. Please note that the price is based on 7 guests. Please note that this is not a penthouse. Located in the Catalina II Building between levels 6 - 15, this older style air-conditioned apartment features a private balcony with ocean views. It also has a fully equipped kitchen, 2 bathrooms, laundry facilities and an open-plan living area with flat-screen satellite TV and a DVD player. Please note that the price is based on 4 guests. Maximum occupancy is 5 (see Hotel Policies). Located in the Catalina 1 Building on levels 6-12, this older style apartment features a private balcony with ocean views. It also has a fully equipped kitchen, laundry, 2 bathrooms and an open-plan living area with flat-screen satellite TV and a DVD player. Please note that the price is based on 6 guests. Maximum occupancy is 7 (see Hotel Policies). Please note that this apartment is not air conditioned. Located in the Catalina II building between levels 2-5, this air-conditioned apartment features a private balcony with pool and ocean views. It also has a fully equipped kitchen, laundry facilities and a separate living room with flat-screen satellite TV and a DVD player. Please note that the price is based on 6 guests. Maximum occupancy is 7 (see Hotel Policies). House Rules Catalina Resort takes special requests – add in the next step! Catalina Resort accepts these cards and reserves the right to temporarily hold an amount prior to arrival. I'd be nice if we could access to tower 1 more easily as we had friends staying in tower 1. Great location, very friendly and helpful staff, lovely apartment and great pool and facilities. Parking for cars no higher than 2m. No 4wds. Minor complaint. Heaps of visitor parking. Chocolates on arrival. Able to check in at 12.30pm. Accessible, friendly staff, great location. Apartment had everything we needed. Was spacious and clean. Would definitely recommend. Beds were small, room is large enough for a king bed. Pillows and quilt are cheap mattress very uncomfortable. When you go away on holiday I feel a little comfort should be provided. Great location, quiet large rooms. Beautiful pool heated just right . Across from patrolled beach and surf club where event was held . Location unbeatable . Room was spacious light airy in April . Staff made life easy . Nothing . Loved it !!!! The 360 degrees view . Right across the road from the beach . Great value for money . Self contained . I understand that security is important but as we had a number of family members staying at the resort, we found it annoying that we had to go down to ground floor to get to any other floor. Loved the apartment & the location. Great access to the beach & only a couple of minutes walk to Cotton Tree.